Whenever I have an opportunity to travel, I look for fiber destinations as well; this should come as no surprise to anyone who knows me. So when we were making plans for a business conference in Syracuse, New York, we decided to tack on a couple of days’ vacation, and the hunt was on for interesting destinations! Since this was my second time to visit Syracuse, I already knew that I wanted to share Coleman’s Authentic Irish Pub with my hubby! (I HAD to have another go at Beef O’Flaherty… and I couldn’t eat quite all of it this time, either.) I had also dropped in on a local yarn shop on that first trip, and was looking for something a little different. And boy, did I find it! 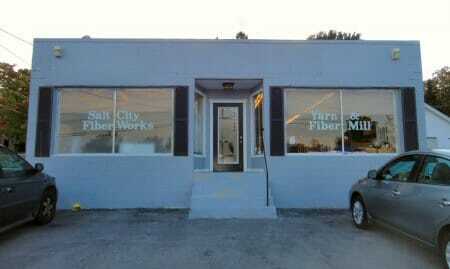 Salt City Fiber Works had sprung up in the meantime, so I sent off an email to ask about a visit. Therese Bishop turned out to be a charming and easygoing person who was happy to answer my questions. We sorted through our respective schedules, and settled on a just-after-closing-time visit. Salt City Fiber Works storefront, at twilight. I was a little surprised at the small size of their building, considering all the activity that I knew must go on within its walls! We stepped inside, and found that Therese is just as pleasant in person as she is in correspondence. We knew she had things to do, so jumped right in to the tour. She explained that they had done a lot of research and selected their Stonehedge Fiber Mill equipment to fit their needs. They proceeded with their business plan, trusting their intuition even though (I’m sure) there were plenty of people who didn’t think this was a particularly good time to take the plunge into a new small business. 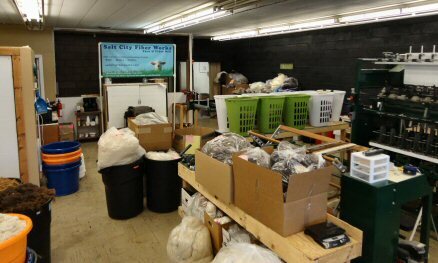 Doubters have evidently been proven wrong, as Salt City Fiber Works is a flourishing concern with a growing customer base! 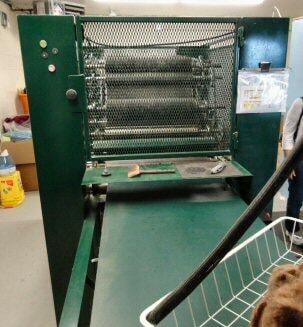 They specialize in custom fiber processing, as well as producing their own locally-sourced roving and yarn. Paperwork for each order follows the fiber through the entire process, ensuring that customers always get their own fiber back. The fiber washing area. Note the bar with pulley system above the sinks. The first step is hand washing small batches in a row of commercial sinks. Ingenuity and attention to detail are obvious everywhere you look – from the nets that hold the fiber and easily move it from one sink to the next to the low-tech but efficient old washing machine (minus agitator) that spins out the water. Therese does some dyeing, but I gather that most of their custom work does not include that service. The fiber is then teased apart by hand and dried on net shelving in the drying room. Temperature and air circulation are carefully watched. 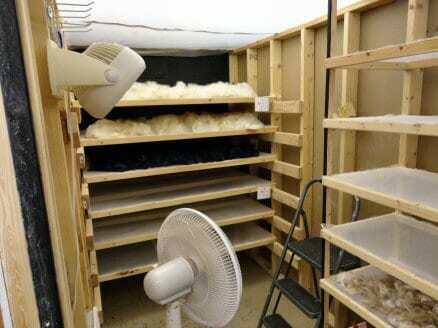 Sliding shelves make it easy to monitor the condition of the clean fleeces. 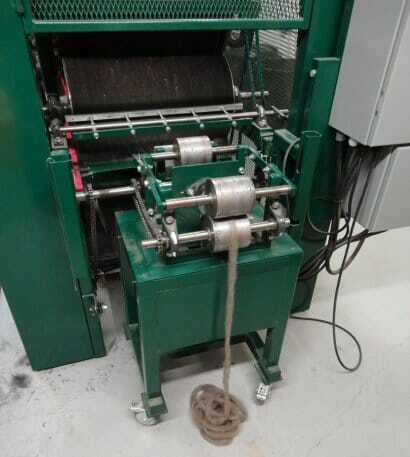 Once dry, the fiber is taken to the back of the building for machine processing, working its way toward the office and retail sections in the front. Lovely fleece and fiber is everywhere! 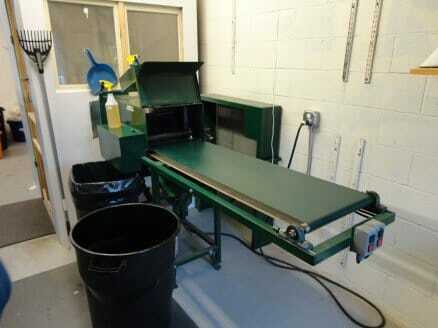 The workflow is organized so that each batch follows a specific path from start to finish. Meet the picker, a truly evil-looking piece of equipment! It really can be dangerous, but is invaluable in opening up the fiber and removing much of the vegetable matter. What you can’t see here are the sharp teeth inside! Even with the enclosure and safety switches, their electrician made them promise to unplug it before they did any kind of cleaning or maintenance. The picked fiber is now ready for carding. Some fibers are blended here, by percentage based on weight, others are simply weighed for the optimal 4 ounces per batch. 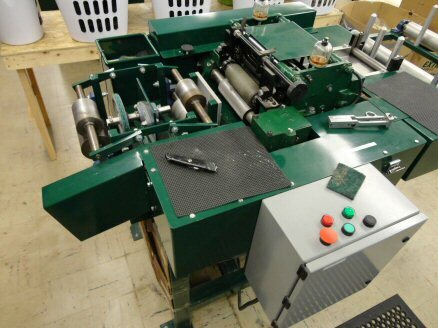 The carding machine can produce batts, cloud or roving. Fiber is run through the card, and usually coils neatly into cardboard barrels, but it was much easier to photograph without the barrel! Beautiful! I thought it would be ready to spin… but I was wrong. Now comes pin drafting. 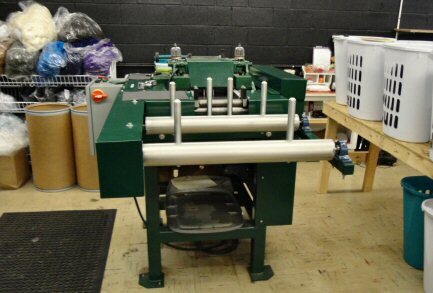 We didn’t get to see this one in action, since it processes several ‘leads’ of fiber together. These leads may all be from the same source, or fibers may be blended here. …and the resulting sliver is more aligned and refined, ready to be spun. 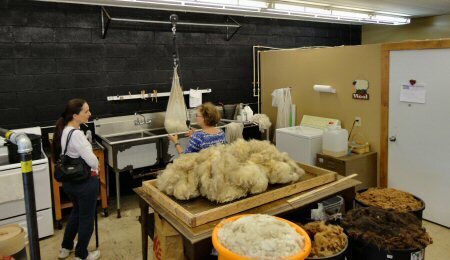 All of this processing takes considerable time and personal attention; each fleece or type of fiber needs something just a little different to bring out its best qualities. In my opinion, this kind of customer service is one of the reasons that Salt City Fiber Works is thriving. I know that I would be delighted to pack up and send any of my fiber halfway across the country, knowing that it – and I! – would be treated with care and respect. Next up – actual spinning!